– Picton’s board of trade petitioned the provincial government to spend $10,000 to dredge the town marsh to improve sanitary conditions. Some neighbouring residents stated, however, that turning the marsh back into a navigable water would be more detrimental to public health than maintaining the status quo. 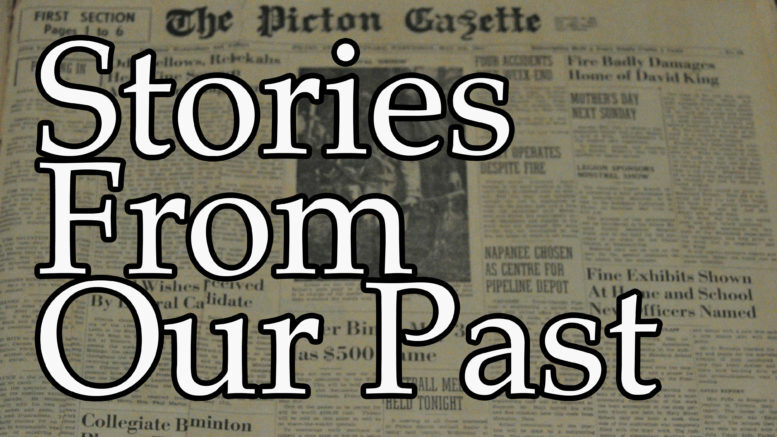 – Alice Barry, an elderly Northport woman was found wandering Belleville’s streets in a daze. With no one willing to take her in, she was kept in the county jail, then put on a train bound for Trenton. – Ameliasburgh’s Harry Dempsey was selected as Prince Edward County’s warden. He said his priority would be to establish good roads to support local trade. – A young boy irreparably damaged the silver screen at the Regent Theatre as he used an elastic band to shoot an imitation coin through it. The $400 screen had a hole in the centre, which left a black spot while movies were being projected onto it. – Dances and card parties were being arranged to financially support the three families who most of their belongings when fire gutted their homes in apartments owned by Mayor Nesbitt McKibbon. – A heavy blizzard blocked roads and caused delays throughout the county. It was estimated some routes might take days to reopen. Hundreds of loads of snow were removed from Picton’s Main Street alone and some drifts were four feet high. – The Prince Edward Ministerial Association raised deep concern about Prince Edward County Fair shows being scheduled on a Sunday. The allowance for Sunday activities was made after rain postponed part of the 1968 fair. The fair board indicated it would not allow gambling or live shows on Sunday and limit the fair’s hours. -The Prince Edward-Hastings Liberals’ plan for an international airport at South Bay was delivered to the federal government. It suggested a new major city would develop and grow around the airport. – A major firm contacted the Canada Manpower Centre to see if approximately 100 labourers were available to work a new year-round mushroom farm in the county. – Despite department store own Jeff Mason’s urgings to go slow, Picton merchants agreed to apply to Ontario’s Ministry of Housing for a $150,000 loan for streetscape improvements. Mason said despite the big spend, potential customers would still be drawn to larger centres. – Ameliasburgh reeve Paul Boyd said instead of building a swimming pool, the County could look to subsidizing buses for local students to swim in Belleville at “far less cost” to its taxpayers. – The Ministry of Natural Resources was going to count the county’s deer population following questions of overpopulation. Warden Ben Prinzen suggested relocating some deer or allowing a limited hunt.